School Opening - a Memory of Baildon. 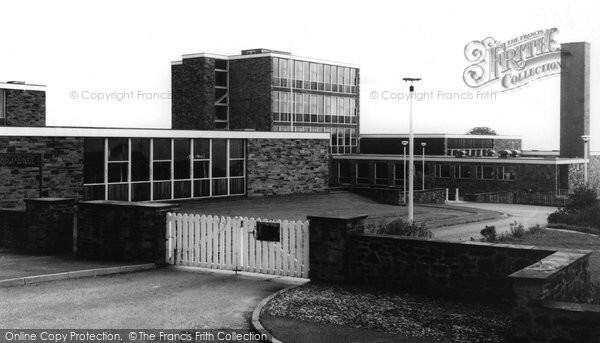 I was a pupil when the school first opened and at that time it was known as Baildon County Secondary School West Lane. Three of my happiest years were spent at this school where the staff dedicated much of their time to extra curricular activities including football, cricket, athletics, cross country and many more sports. Especially enjoyable was a whole variety of outward bound pursuits lead by Mr Cogan who took us on numerous camping, potholing, climbing, YHA trips in the Yorkshire Dales and Brittany in France. Allan Crapper and myself even slept out in an igloo we built during one particular bad winter. Our cricket team won the Bradford Schools Cricket Trophy two years in a row in 1964 and 1965. We also had a successful football team that was runner up in one of the Bradford Football Sheilds in either 1964 or 1965. Mr Ogden was the headmaster, Mr. Turner for Science, Mr Davis for Geography, Mr Sid English for English, Mr Bill Morgan for History, Miss Myers for Music and Mr Randolp Overend for P.E. Unfortunately I cannot remember my math teacher's name but he finally got the "penny to drop" for me and this subject has become one of my favourites in my more mature years. They were all wonderful teachers that created a great bond with all their pupils. My class mates included Dave Whithead, Jimmy Kinsella, Nigel Wood, Philip Chester, Allan Crapper, Phil (Tweedy) Harris, Susan Booth, Susan Herity, Stuart Bairstow, Jeff Barstow, Geof Bailey, Lawrence Abraham to name but a few. I now live in Atlanta, Georgia in the USA but travel back to the UK fairly frequently and occasionally I take a trip down memory lane and return to Baildon where I enjoyed some of my happiest years. A memory shared by Andrew Jowett on Oct 19th, 2010. Send Andrew Jowett a message. Andrew. I think I remember you at West Lane. I started in 1961. A few other names in your piece stir the embers. I recall the science teacher, Mr Turner, telling me, and the rest of the class, I didn't belong in the school because I was living in Bingley, having flitted there with my parents in 1962. Bill Morgan, I remember, being my form teacher but not really engaging much with him. Most of this was MY fault, I add. I was something of a misfit I think, looking back. I left in 1964 and plonked myself down at Bingley Tech for two years before trundling on to Bingley Grammar School, where I languished unsuccessfully for two years. Luckily, found myself a seat as a "cub reporter" on a weekly paper and have laboured in that role in various guises ever since, mostly as a daily paper journalist. Still at it, semi-retired as a scribbler on the weekly paper that serves Skipton in North Yorkshire. Nice to read that you had such a happy time at West Lane and have such fond memories. Sadly, mine don't quite match. It just show one man's meat is another man's poison. I also attend West Lane when it first opened.I lived in Shipley and caught a school bus.I enjoyed my time there also went potholing with Mr. Cogan who taught R.I.I went to Bewely Park at Pately Bridge.I went out with a girl there called Pat Jowett was she related?. Friends there were Alan Bousfield and Peter Ackroyd.